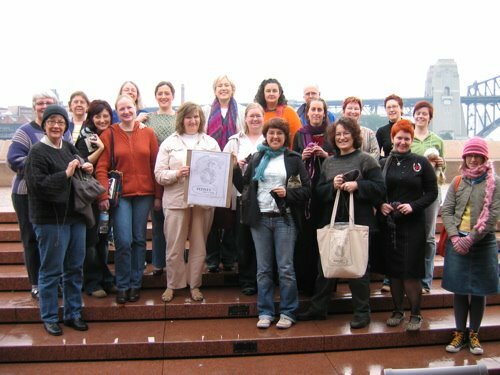 Here are some of the participants of the highly successful World Wide Knit in Public day held at the Sidewalk Cafe at the Sydney Opera House. This was a very handy location for me as I was able to duck out between shows and partake in a bit of WW public knitting. This slightly damp lot are proudly displaying various bits of knitted goods or their KIP t-shirts and bags. Check out other photos on Kris's or the SSK site. The dampness was not restricted to the world outside - inside I was learning the cues for a wonderful show called 'Vula' which means Moon in Fiji. 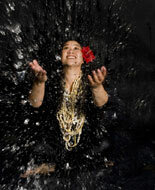 The show is "Performed on a stage flooded with water, it combines magic and illusion with traditional song and dance to create a captivating piece of Pacific Island visual theatre." Normally water and electricity don't mix so I'm nervous when the entire stage is one giant wading pool surrounded by lights and leads. The performance is so captivating though, that my fears, though not allayed, are forgotten as I listen and watch the beautiful singing and sinuous movements of the 4 performers. I don't have much time for knitting either as it's an uncued show - I have to do all the lighting cues myself and after my long stint on House Lights in the Bennelong Palace I'm a bit out of practice. "Wot - you mean I have to concentrate!" I'll have to find a nice simple garter stitch on big needles project to keep on the go.